E-Sports is the name that has been given to competitive multiplayer video gaming or the professionalization of video gaming. eSports has exploded in popularity in recent years and many any major operators, including William Hill and Ladbrokes, offer eSports betting odds. 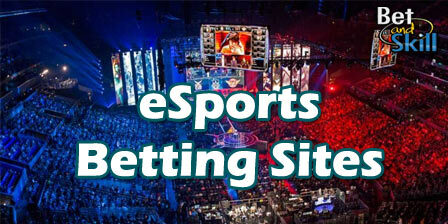 Find here the best eSports betting sites on the Internet. We regularly compare all the eSports betting sites taking into account several important factors. We update our rankings every time these factors change, in order to provide you with the best e-Sports betting sites on the Internet! Primarily, we want you to find a site that is safe, reputable and fair. We rank the best eSports betting sites according to their ability to pay winners, their games selection, the types of bets they have on offer, ease of use, the bonuses and rewards on offer, the quality of the customer support and whether or not their odds are fair. If you sign up at one of our recommended sites you will be pleased with the service you receive. Exclusive: Place a Match Winner or Win/Draw/Win five-fold accumulator (or higher) on any eSport matches and if you are let down by one selection, Betway will refund you with a free bet equal to your stake up to £25. Betting on eSports is actually just like betting on traditional sports. You just need to know which sites have eSports to offer and how to place your bets. E-sports now reach over 70 million people worldwide and it will continue to grow as it gains popularity in Europe and America. Unfortunately, if you live in the United States, your chances of getting in on the action are slim because online gambling is illegal in most states. However, fantasy eSports (with real money options) is allowed for most US citizens (and players from outside US as well). The most common video games associated with eSports betting are first-person shooter (eg: CounterStrike), real-time strategy (eg: Starcraft), and multiplayer online battle arena (eg: League of Legends). Other popular eSports games include Overwatch, Warcraft 3, World of Tanks, Quake Live, World of Warcraft, Halo, FIFA, Call Of Duty, Smite, Heroes of the Storm (HOTS), Magic the Gathering and Hearthstone. "Top eSports Betting Sites - List of the Best e-Sportsbooks"